NEW: A Handbook for Exploratory Action Research, by Richard Smith and Paula Rebolledo, was published by the British Council in January 2018 and is now freely downloadable (click on the title here). In this approach (Exploratory Action Research), teachers carry out small-scale, practically useful research in order to understand a given situation (a problem, a puzzle or even a success) and, on that basis, plan to bring about change. 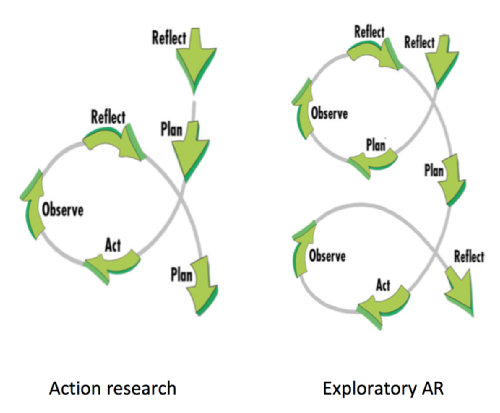 What is exploratory action research? The notion of 'Exploratory action research' was developed in the context of advisory work for the still-ongoing British Council Chile / Ministry of Education Chile Champion Teachers Action Research Project (2013--present). The project has increasingly become embedded within the Chilean Ministry of Education's overall approach to continuing professional development for teachers of English in secondary schools, to the extent that it is now being referred to as a 'programme'. It also forms the basis for mentoring schemes being organised by the British Council in Uruguay and Peru (both, 2016 onwards), and - from 2018 - additionally in Colombia and Mexico. The Exploratory Action Research approach has also been adopted for mentoring schemes organized by the British Council in India (AARMS) and Nepal (AARMS-Nepal), as well as for the TESOL Electronic Village Online on 'Classroom-based research for professional development' in January–February, for two years running in 2017 and 2018. [T]he project provides a model that is both contextually relevant, and intuitively appealing to teachers, both veteran and novice. In this sense, we can say that it is a truly innovative endeavour, one that should be communicated more extensively. The Exploratory Action Research approach relates to previous, underlying research into teaching in difficult circumstances, teacher-learner autonomy and the promotion of teacher-learner autonomy in initial teacher education. Doubts have previously been expressed – and continue to be expressed – about the feasibility of teacher-research forming part of ordinary teachers’ lives [...]. At the same time, teacher-research has been viewed as a particularly valid means for teachers to generate appropriate methodology in difficult circumstances (Smith 2011), and its wider transformative potential has long been recognized. My principal concern when responding to the challenge presented by the Chile project was, then, to recommend realistic procedures which would take full account of probable obstacles (cf. Smith, Connelly and Rebolledo 2014: 116), which would not add significantly to teachers’ existing burdens, and which would, indeed, need to be built into teaching schedules of up to 40 lessons a week in situations where class sizes of 40 or more were quite normal. I hoped – more positively – that the approach would be experienced by busy teachers not only as viable but as practical and useful. Indeed, it would need to be seen from the outset as something which offered hope in difficult circumstances, not as yet another imposition in a long line of inappropriate in-service interventions. [A] dominant theme in final reflections was that participants had learned to listen to their students more, and that doing exploratory research had thereby fulfilled a valuable pedagogical function which plunging immediately into the ‘action’ part of action research might not have fulfilled to the same extent. Overall, then, we feel we succeeded in developing innovative ways of making teacher-research appear feasible as well as desirable in teachers’ eyes, in apparently very unpromising conditions. [...] Our experience suggests that the success or otherwise of initiatives to engage teachers in teacher-research may depend largely on what kind of teacher-research is introduced to teachers, how it is presented to them, how it is supported and what style of sharing of the research is expected. Five cohorts of teachers have now passed through the programme, with the Ministry of Education in Chile becoming increasingly committed to its management and to dissemination of the notion of exploratory action research via English Teacher Networks. RICELT ('Red de Investigatores Chilenos en ELT' - the Network of Chilean ELT Researchers) has also become increasingly committed to its support. The role of mentors during the first year had been to provide advice on research procedures within a dialogic relationship, mainly via email-based communications. An even more humanistic kind of relationship between new teachers and mentors was achieved via skype and phone conversations during the second year, which itself began with workshops for English Teacher Network participants in five locations the length of Chile. These workshops were organised by the English Opens Doors Program of the Ministry of Education, which was by this point becoming more involved in the initiative. From Year 2 onwards, mentors who were experienced secondary school teachers and former Champion Teachers themselves were preferred to university-based teachers. This change was intended to bring about greater sustainability of the project and came also in response to participant feedback. The Ministry of Education got involved from the beginning but not at their current level of involvement. The EAR project is now part of the CPD they offer to all English teachers, and school communities are becoming increasingly aware of this. There are two publications associated with the project, one to come out very soon: this is also making the initiative attractive. Here is a 2014 interview with Paula Rebolledo who was at the time 'Senior Mentor' for the Champion Teachers project, about teachers' reactions during the first and second year. The nine stories that illustrate the approach come from teacher-researchers who participated in the first cohort of the programme in 2013. Their narratives, given in third person and illustrated in innovative ways for a research publication (through photos, icons, drawings, and diagrams) give testimony to the effectiveness of the project. Its success can be judged twofold: firstly, by the evidence of teacher learning leading to ongoing development (presented through findings and teacher researchers’ further action plans), and secondly, through the testimonies of students and their learning. The book was used to introduce university-based teacher educators to exploratory action research, at a seminar organised by the MInistry of Education and the British Council Chile on 22-23 April 2016. We have been investigating the impact on participants of having been involved in the Champion Teachers project and we are attempting to keep track of changes in initial and in-service teacher education in Chile as a result of the project. [Update (July 2017)]: In 2017–18, principles and practices of exploratory action research are being: further disseminated via workshops with Paula Rebolledo, Claudia Bustos Moraga and Amol Padwad in Argentina, Turkey and India, respectively, as well as via the January-February 2017 and 2018 TESOL CALL-IS Electronic Village Online. See International Festival of Teacher-research in ELT. [Update (September 2017)]: The British Council Aptis Action Research Mentoring Schemes (AARMS) in India and Nepal (both set up in 2017) are running according to Exploratory Action Research principles. In September 2017, presentations at the AINET International conference on teacher-research, and a four-day workshop in Assam, India, took the ideas of Exploratory Action Research to a new audience of teachers in India. On 25-27 August 2017 a three-day British Council workshop in Lima introduced principles of exploratory action research to 70 Peruvian teacher educators (day 1) and 50 selected teachers (days 1 to 3), launching a Peruvian Champion Teachers scheme modelled on the Chilean programme. [Update (January 2018)]: Teachers reported on their projects and interacted with Chilean Champion Teachers at an International Seminar on Exploratory Action Research in Santiago, 11-12 January 2018. Here is the first published report on the new Peruvian Champion Teachers scheme. Discussions among British Council and Ministry of Education officials in Chile, Peru, Colombia and Mexico led to an internal British Council application for funding to expand the Chamipon Teachers project (and associated Exploratory Action Research approach) to Colombia and Mexico, starting later in 2018]. [Update (January 2018)]: Publication of the book A Handbook for Exploratory Action Research by Richard Smith and Paula Rebolledo. [Updates (April 2018): EAR was the approach adopted in the January–February 2018 TESOL CALL-IS Electronic Village Online on Classroom-based research for professional development. On 11 March 2018, participants in the AARMS project in India, which had followed an EAR approach, presented on their work at a 'mela' organized by the British Council at Ambedkar University, New Delhi. Teachers on the equivalent programme in Nepal presented on their work at the end of April, and the scheme will be expanded to seven mentors starting in May 2018. [Update (October 2018): Publication of the book Champion Teachers Peru: Stories of Exploratory Action Research (eds. Rebolledo, Smith & Bullock). [Update (November 2018): 92 Peruvian, Chilean and Colombian teachers came together to present on their recently completed practitioner research at the 2nd Exploratory Action Research International Seminar / Champion Teachers Pacific Alliance Summit in Lima, Peru, 23–24 November. The event was also attended by Ministry of Education / British Council representatives from across Latin America. The Champion Teachers scheme, based on the Exploratory Action Research approach, will continue at the same level of participation in 2019 and will be further expanded to Argentina. In September 2018, a further book of reports - Champion Teachers Peru: Stories of Exploratory Action Research - was published. This will be officially launched at an event in Lima in November, where teachers from the programmes in Chile and Peru will come together to share their findings. We are interested in further collaborations with Ministries of Education, regional British Council offices, teacher associations and universities to introduce secondary or primary teachers of English to Exploratory Action Research and to evaluate the impact. Please contact Richard Smith (R dot C dot Smith at warwick dot ac dot uk) in the first instance. Rebolledo, P., Smith, R. and Bullock, D. (eds). 2016. Champion Teachers: Stories of Exploratory Action Research. London: The British Council. Online (Open Access). Rebolledo, P., Bullock, D. and Smith, R. (eds). 2018. Champion Teachers Peru: Stories of Exploratory Action Research. London: The British Council. Smith, R. 2011. ‘Teaching English in difficult circumstances: A new research agenda’. In Pattison, T. (ed.) IATEFL 2010 Conference Selections. Canterbury: IATEFL. Pre-publication version online. Smith, R., T. Connelly and P. Rebolledo. 2014. ‘Teacher-research as CPD: A project with Chilean secondary school teachers’. Chapter 5 in Hayes, D. (ed.) Innovations in the Continuing Professional Development of English Language Teachers. London: The British Council, pp. 111–128. Smith, R. 2015. ‘Exploratory action research: why, what, and where from?’ In Dikilitas, K., Smith, R. and Trotman, W (eds). Teacher-researchers in Action. Faversham: IATEFL, Chapter 3 (pp. 37-45). Online (Open Access). Smith, R., P. Rebolledo, F. Shamim and M. Wyatt. 2015. ‘Supporting teacher-research: challenges and opportunities’ In Pattison, T. (ed.) IATEFL 2014 Harrogate Conference Selections. Faversham: IATEFL, pp. 197-201. Pre-publication version online. Smith, R. and Rebolledo, P. 2018. A Handbook for Exploratory Action Research. London: The British Council.